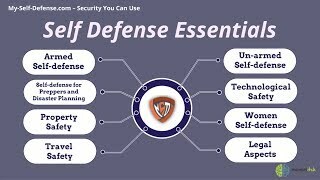 Do You Know How to Protect Yourself With Home Self Defense? Home self defense could be the difference between life and death. With threats such as home invasions and burglaries you can’t risk not being prepared. Some simple steps can keep you, your family and your property safe from potential threats. NOTE: This is just a few tips and certainly isn’t exhaustive list. Each situation is different and you should carefully assess your needs. Make your home look like someone is always living in it. Keeping curtains closed in the day can give the impression that the house is empty. Placing your lights on a timer when you are not home so the lights automatically turn at dark is a great to appear home when your not. Install deadbolts or mortise locks on all doors that lead to the outside. Be sure any lower level windows are also securely locked. To help prevent home invasion or to help defend against it – purchase a large self defense spray to keep close to each door. When leaving town be sure to put your mail on hold and stop newspaper or milk deliveries. Cutting your lawn is also a great idea right before you leave town. Keep bushes and other foliage cut back to prevent burglars or possible assailants from hiding in them. Keep valuable items like high end TVs away from windows and doors where passer byes can not easily view them. Consider installing a monitored burglar alarm with panic buttons throughout your home. These are a great way to protect yourself while you are home and protect your home while you are out. Be sure to lock you shed and garage with a good lock and keep tools locked up so they can not be used to break into you home. If you have a ladder around your home, make sure you use a chain and padlock to secure it to a fixed object so a criminal can not use it to gain access to an upper floor. Check if there is a neighborhood watch group in your area. Your local police can help you get set up with one if available. If one is not in your area, consider setting one up as it will protect you and your neighbors. If you have children that are home alone, be sure they can do all of the following for maximum home self defense. Make sure the child can call 9-1-1 or your area’s emergency number, or call the operator? Be sure they can give directions to your house in case of an emergency? Can they use the door, windows, locks and the alarm system if you have one? Be sure they know never to let anyone into the home without asking your permission. Make sure they know not to let a caller or someone at the door know they are alone. If they use a key to get into your home, be sure they carry it in a safe place (inside a shirt pocket or sock)-do not leave a house key under a mat or on a ledge. Teach your children not to go into their home if things do not look right- a broken window, ripped screen, or opened door. Keeping yourself and you family safe when your there or not requires some thought, money and time. Proper security such as an alarm system, large pepper spray, and good locks can be the difference between someone in your home and someone attempting to enter your home. Some people even go to the extrems of barred lower windows, security film on windows, full surveillance systems and panic rooms. Going overboard on security is never a bad thing and at least, it will give you peace of mind.